A predilection for clean design and scaled-back storytelling is evident in the work of Philadelphia-based Jenny Lynn, whose photographic work has graced book covers and magazine advertisements. She recently conceived and edited EyeBook, a compilation of works by 60 artists, all tackling eyes as the subject matter. Yet in her two series for this solo show, Lynn proves that as an artist working with archival black-and-white processes, she knows how to lend just the right aura of mystery to her prints and collages. In the “Little Rituals” series, one of the strongest works is a conceptual piece in which two empty chairs face each other in an empty room, summoning ideas about abandoned spaces or hollow conversations. In another picture a woman looking away from the camera runs her hand through her hair, raising questions not only about the long silver glove she’s wearing but also the implicit desire for anonymity. 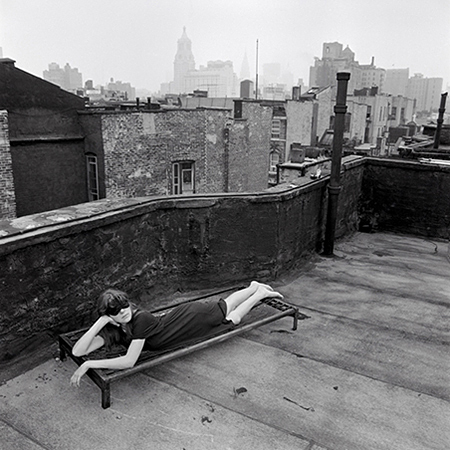 Questions about identity also arise in “Rooftop,” where a masked woman lounges on a rooftop, alone against a metropolitan skyline. The second series, titled “Extrapolations,” are silver gelatin collages that have a Wunderkammer quality. In “Entrance” Lynn carefully arranges small negative images of a strand of hair, an old-style key and a map of California around small positive images of a woman’s shoe and a pyramid-shaped tomb beneath palm trees. These surreal, disparate images feel like they had long been swirling around in the artist’s mind until she saw their potential for storytelling. The narrative potential of these collages is not easily accessed — but the viewer is enticed to try.